Hydra-Lift 55 Gallon Drum Rollers - Morse Drum Rollers - Essex Drum Handling your Drum Handling Equipment Experts in New Jersey. 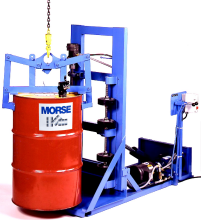 Call today for a quote on Morse Drum Handling Equipment for 30 & 55 Gallon Drums. Hydra-Lift Drum Rollers mix & blend the contents of your closed 55 gallon drum better than hand-mixing and much more efficiently than insertion blending. 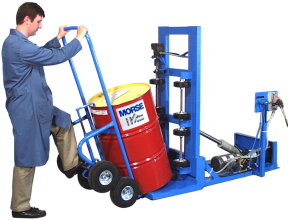 Morse Hydra-Lift Drum Rollers effectively blend the contents of 55 gallon drums so you can stay safe, clean and have perfectly blended materials. No more splatters, spilled materials or un-blended contents. Get everything off the bottom of a drum with a drum roller designed to blend the contents fast efficiently. Call Essex Drum Handling for the Morse Drum Roller & Drum Mixer equipment you need to keep your facility running smoothly. Drum rollers make it easy to lift, mix and blend your closed drum safely and cleanly in your workshop or manufacturing plant. Morse developed the basic Hydra-Lift Drum Roller concept to provide "hands-off" drum handling and mixing. Enjoy the benefits of easy, ergonomic loading and unloading and eliminate many hazards of manual drum handling. The built-in hydraulic system lifts your drum from floor level and places it quickly and efficiently for rotation. Hydra-Lift Drum Rollers accept a steel drum in upright position at floor level (add Option POLY-456 to roll a plastic drum). You control the hydraulic powered drum tilt to lift the upright drum and place it down on drum rotator wheels. Start and stop drum rotation with a second control. You control the drum rolling speed. A 55-gallon (210 liter) drum can be rolled from 5 to 20 RPM (4 to 16 RPM on 50Hz models) as desired to thoroughly mix drum contents. Then return the drum to vertical to unload. These Hydra-Lift Drum Roller Models accept a steel drum in upright position. You control the hydraulic tilt to lift an upright drum and place it down on drum rotator wheels. Start and stop drum rotation with a second control. Roll a drum at 5 to 20 RPM until contents are mixed as desired. Then return the drum to vertical to unload. Drum Rotators Save Time, Labor and Money! Load your upright drum onto drum turner with a below-hook drum lifter. Model 90 Verti-Karrier shown above. The ergonomic design of Hydra-Lift Drum Rollers allows you to load an upright drum at floor level. 400 Lb. dry load. A shifting dry load exerts greater stress on the drum rotator than the fluid motion of a liquid load. Overall dimensions: 67" (170 cm) long x 37" (94 cm) wide. See: Dimensional Information. Available with choice of electric motors. Explosion proof motors available. Install all Morse Rotators in accordance with OSHA requirements for enclosure and safety interlock, etc. Drum roller automatically turns off when enclosure door is opened. Enclosures for Hydra-Lift Drum Rollers are 88"L X 40"W X 74"H.
For OSHA compliance, see OSHA subpart O.1910.212 "General Requirements for all Machines." Power connections and motor controls must comply with applicable codes. Idler Attachment to roll 1 to 5 gallon cylindrical can on a Hydra-Lift Drum Rotator.